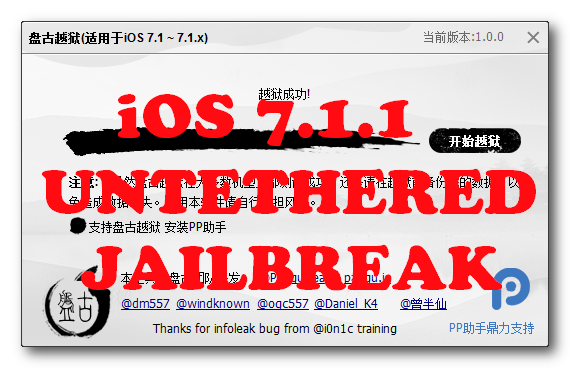 This is step-by-step instructions on how to perform untethered jailbreak of iOS 7.1 – iOS 7.1.2 firmwares using Pangu for Windows. Good news for all jailbreakers: i0n1c has just posted a video showing his new utility for untethered jailbreak of iOS 7.1.1. It is called Cyberelevat0r and according to its creator, to jailbreak iOS 7.1.1 it uses a recently discovered kernel bug. Nobody knows for sure if the hacker plans to release Cyberelevat0r to public or not. Anyway, let’s take a look at how it works. The jailbreak, which has not yet been released, is unique in that it uses a kernel bug which is hidden inside functionality that can be easily reached, even from within the iOS application sandbox. I honestly hope that i0n1c will release its untethered jailbreak of iOS 7.1.1. However, I don’t think that the release will take place before the release of Apple’s iOS 8. You see, the hackers need to make sure that the bug used for jailbreak remains unpatched. Apple is expected to announce its iOS 8 at the annual Worldwide Developers Conference, which is set to take place in June. The jailbreak may be released after the conference. According to what i0n1c writes, his jailbreak uses a new kernel bug. This vulnerability differs from those that were used previously. 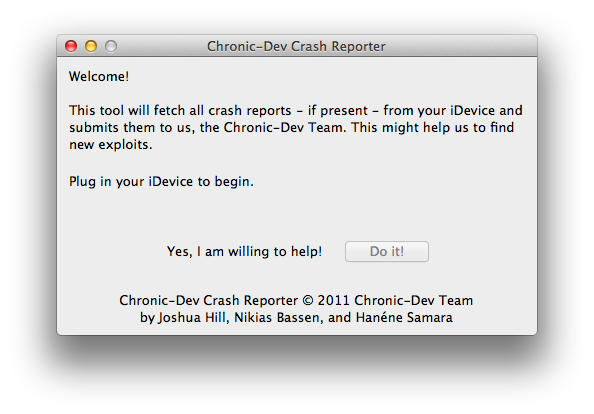 This means that the exploit code can be used to break out of any application that you exploit. This is very different from nearly all of the kernel vulnerabilities used in iOS jailbreaks since iOS 4. In case you don’t know, i0n1c on Sunday shared a photo of a jailbroken iPhone 5c with iOS 7.1.1 on board running Cydia. Another hacker, Winocm, posted a video showing a jailbroken iPhone 4. The jailbreak has not yet been released. I think we should wait for a while. Yes, we have benefitted financially from our work, just as many others in the jailbreak community have, including tweak developers, repo owners, etc. Any jailbreak from us will always be free to the users but we believe we have a right to be compensated in an ethical way, just as any other developer. Well, I don’t think it’s strange that the creators of untethered jailbreak for iOS 7 accepted such an advantageous offer. They need money to continue their work on jailbreak. If they had no money, we wouldn’t have jailbroken iPhones, iPads and iPods. It’s simple. 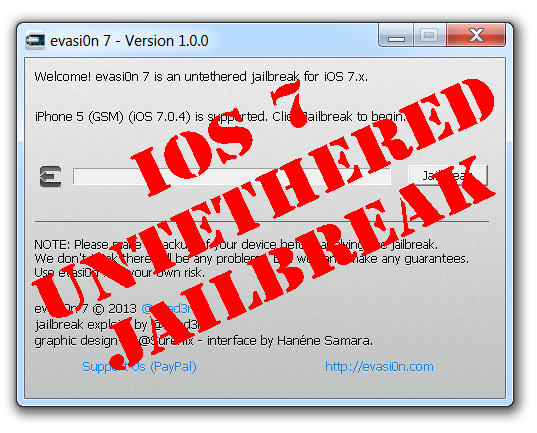 This is step-by-step instructions on how to perform untethered jailbreak of iOS 7.0 – iOS 7.0.6 firmwares using Evasi0n 7 for Windows. One of the most interesting Samsung Galaxy S4’s features is probably Smart Pause. This is the feature that automatically pauses video playback each time you look away. For quite a long period of time those who use iPhones had to put up with the fact that there’s nothing similar for the iOS platform. And then FaceHalt was released. iOS 7 has been jailbroken. 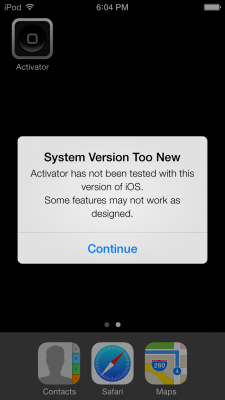 Popular iOS developer Ryan Petrich has posted a screenshot which appears to show Activator running on iOS 7. 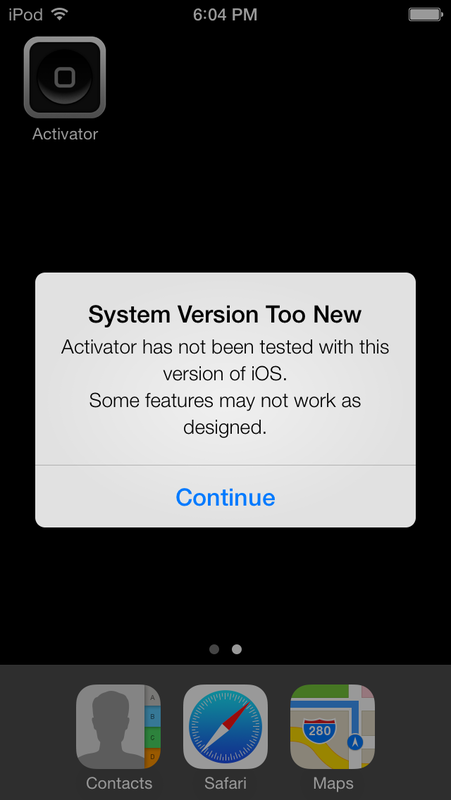 Activator has not been tested to work with this version of iOS. Some features may not work as designed. Notably, this alert does not seem to be a UIAlert that could be generated from within a sandboxed application, suggesting that device may be jailbroken. It’s unclear what expoit was used by Petrich. Last year Apple had closed comex’s developer account based exploit that had been used by hackers to root their iDevices for two years. Hacker p0sixninja recently announced that he has “got a lot of amazing things coming to you all soon. 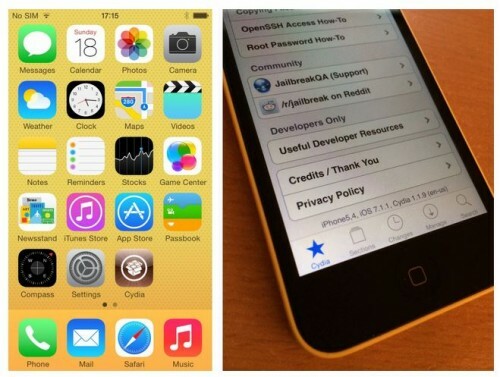 think bigger than jailbreak ” It’s been suggested that he may have found a bootrom exploit. 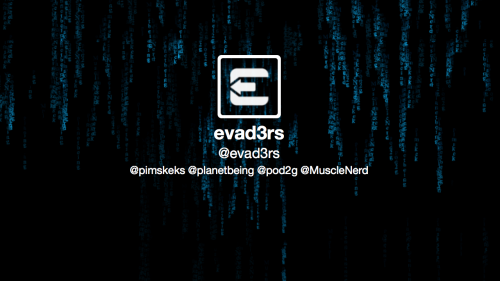 The Evad3rs Dev-Team has launched an official website for the jailbreak of iOS 6.1, called ‘Evasi0n’. 68%: Applications for Windows and OS X are finished. Remains linux and some testing. Come back soon! A progress bar indicates the team is more than half way done the jailbreak. 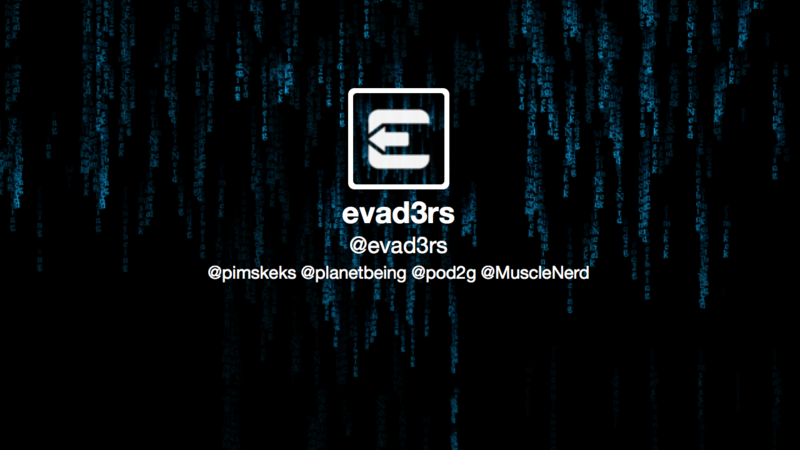 According to the team new Evasi0n untethered jailbreak is compatible with all iPhone, iPod touch, iPad and iPad mini models running iOS 6.0 through iOS 6.1. 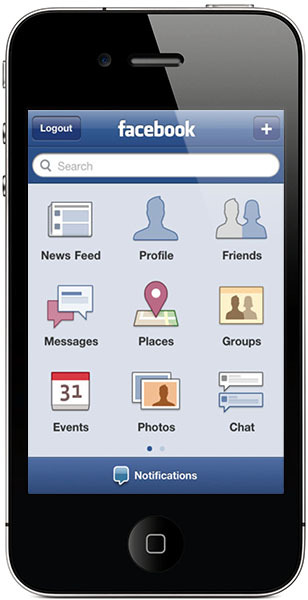 This week Gareth Wright reported that Facebook’s app for iOS has a security vulnerability through which malicious users can access login credentials saved in a .plist file of the app. With a copy of that .plist file malicious users could automatically log into the affected user’s Facebook account on another device. Reportedly, the vulnerability also exists on Android devices. Wright describes several different ways in which your login credentials could be obtained by a malicious user, including hidden applications installed on shared PCs, customized apps, or modified speaker dock that could copy your plist. According to Facebook, the issue only affects jailbroken or lost devices, as it requires physical access or installation of a custom app on the device. But Wright and The Next Web pointed out that simply plugging into any device would be sufficient for malicious users to gather these files. The Next Web has confirmed that Dropbox for iOS is also vulnerable to this issue. Given that two such high-profile apps as Facebook and Dropbox are vulnerable to credential theft, it is likely that other apps are also affected by the issue. As many reports note, this method of gathering login credentials is not actively utilized in a malicious manner, and users can protect their data for the time being by not plugging their devices into shared computers and charging stations.